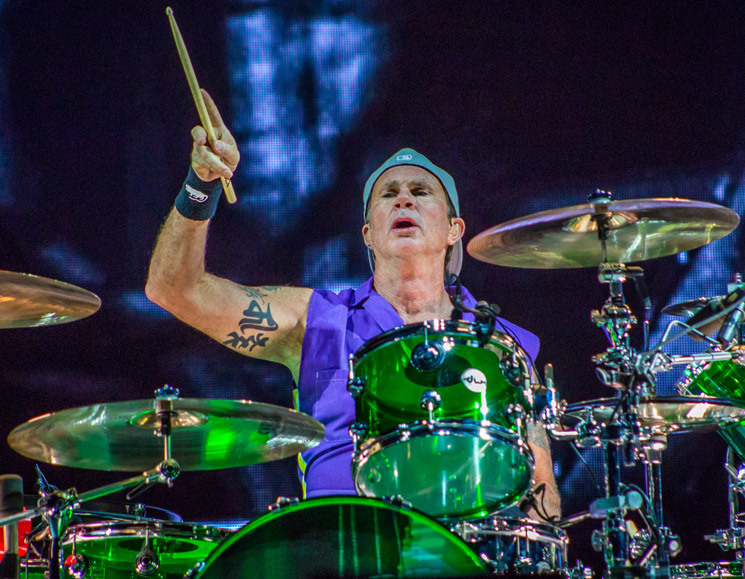 Red Hot Chili Peppers drummer (and PUP's new BFF) Chad Smith has suggested that the band may retire from touring sometime soon. In a recent interview on The Eddie Trunk Podcast, Smith opened up about the future of the group and its aging members. "We were riding in a van after a gig and Flea was like, 'How much longer do you think we should… How do you think we should end this?'" Smith told the program's host. Smith admitted he wasn't sure how to answer the bassist's question, explaining: "I want to make records, I still love making records, but the touring part… I don't know if we can continue." He continued, "I mean, three of us are 54 years old — Anthony [Kiedis], me and Flea. Josh [Klinghoffer] is 38 or 39, so he's a young man. But I don't know if we can continue to do the long tours — the year, year and a half we normally do. That's a good question." Smith added, "We all have families and different things, your priorities shift a little bit. You kinda see that what's gonna work for you maybe doesn't necessarily work for other bands. But again, we're just so grateful that people want to come and see us play, and we love to perform. I don't know in the future how that's gonna look." Listen to the full podcast episode over here. Smith's segment starts at the 15:00 mark. RHCP toured extensively earlier this year in support of The Getaway; a handful of shows had to be rescheduled due to frontman Kiedis battling bronchitis.